The word boteco (or botequim /butiquim) is derived from the Portuguese word botica (bodega in Spanish), which is itself derived from the the Greek word Apotheke – meaning a place or store where goods are sold. However, if in Portugal a botica was a place of storage, in Brazil a boteco evolved into becoming the place where you go for a beer. In other words botecos are the Brazilian equivalent of a pub. Where can you find botecos? Brazilian botecos, like pubs in the UK, are ubiquitous and can usually be found on most street corners around the country. Botecos do not discriminate, regardless of social class or standing and you can find them in most parts of Brazilian cities, from the favelas to the most ‘chic’ (or chique as Brazilians like to say) neighbourhoods. Unlike bars they do not charge entrance fees or add service charges, and there’s certainly no dress code. Well, like pubs it varies, although there tends to be a ‘typical’ type of both. For example, at one end of the pub continuum you have the rough locals-only boozer where you can buy stolen DVD players for a tenner, whilst at the other there are poncey gastropubs serving gourmet burgers for £15 (excluding chips). The pub frequented by my father and I on (too) many occasions over the years. Like pubs there’s also a boteco continuum and similar to their UK counterparts most tend to lean towards the lower / mid-ranges of the spectrum. However, the increasing number of upmarket ‘botecos’ has led to the use of terms to differentiate between them: pé sujo (diry feet) and pé limpo (clean feet). Pé sujo botecos are where you should go if you want an authentic Brazilian drinking experience. Unlike pubs they are pretty missable, seeing as they often lack signage and sometimes don’t even bother with names. The exterior of a typical pé sujo boteco. Usually they consist of a fairly small interior that is open to the street, whilst most tables and chairs can be found on the pavement outside. In many ways this makes sense because whilst pubs aim to protect you from the elements, in Brazil it’s about enjoying them. The pavement outside is the equivalent of pub beer garden, although the difference is that in the UK we only get to use them three days a year – and even then doing so whilst wearing a coat. And, given that most of the action goes on outside the boteco the decor inside is usually…errr… basic. Most tend to go for the bathroom look, seeing as they are often covered from floor to ceiling in white tiling. Sometimes the bathroom look is taken quite literally, as you’ll occasionally find a toilet basin sharing space with a precariously wired plastic showerhead. The tiling itself is actually quite a good indicator of each boteco’s spot on the ‘boteco continuum’ – with the mustier and dustier being less chique but certifiably pé sujo. Another good indicator of the pé sujo-ness of a boteco is to have a quick scan of the furniture. Plastic chairs and tables usually confirm that your feet may well get dirty, whilst the presence of their wooden cousins typically indicates a higher level of boteco chique-ness. Inside you’ll find a small(ish) bar, sometimes with fixed seating that serves a similar purpose as bar stools do in pubs. There’ll also be a plastic box-like space for the cashier and a glass cabinet displaying a variety of ‘vintage’ salgados (savoury snacks). At the other end of the continuum pé limpo botecos may have tiling consisting of more than one colour and there may well also be some more sophisticated fittings and furnishings – although definitely no log-fires. What do they serve? And by whom? 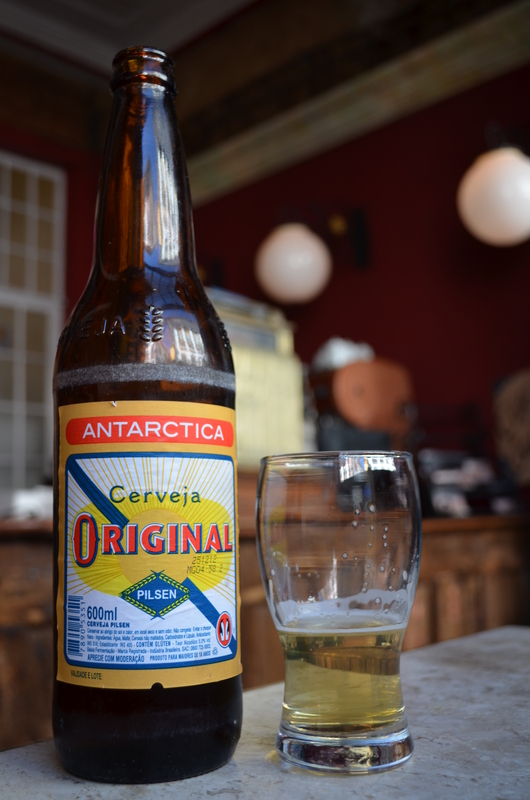 Other than lukewarm snacks and some basic dishes (feijoada, etc) the purpose of a pé sujo boteco is to serve the coldest beer known to mankind, which is understandable when it is 30c+ outside. This is facilitated by the presence of two (at least) of the biggest refrigerators you’ll probably ever see in your life. Conveniently they have a digitised indicator to reassure you that your beer is being stored at a temperature of at least -5c. The most common is a garrafa (bottle) and unless you order a long neck the idea is to share them between whoever you are sitting with – that way the beer never warms beyond freezing. The selection of beer usually consists of Skol, Brahma, Antarctica or Original, and these, for the most part, are pretty bland Pilseners – which is one reason why it doesn’t matter how cold they are (see here for more on this). Pé sujo botecos are typically manned by a few staff (more if there is a ‘kitchen’), whom bring your drinks to your table as opposed to you queuing to buy them at the bar as you do in pubs. Tabs are paid when you leave and divided between whoever you are with. 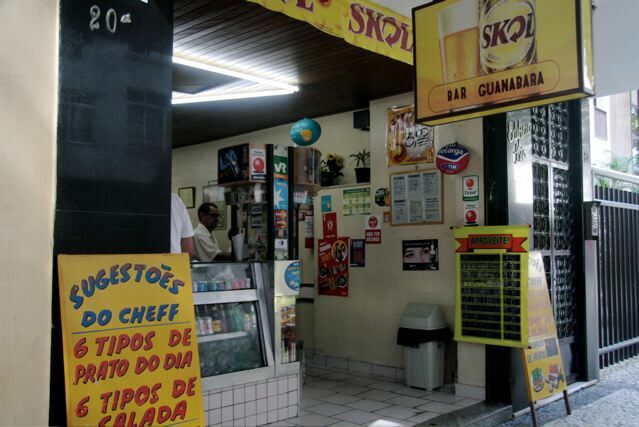 As mentioned above, pé limpo botecos may have a wider variety of types / styles of beer, and their food menus will probably also be a bit more extensive (poncey). Additionally, your table will most likely be waited upon by an overeager waiter who will aggressively wrestle your chope from you before it’s finished and then plonk another one down regardless of whether you actually wanted it in the first-place. One aspect I particularly like about drinking in a boteco is the saideira. Effectively, this is the Brazilian equivalent of the UK’s “one for the road” pint. Basically, it involves cracking open one last bottle at the bar whilst your group settles the bill. I say “one”, but I’ve been involved in hour long saideiras before – possibly longer but you’ll probably forgive me if my memory is a little fuzzy. Pé sujo botecos are to Brazil what pubs are to the UK. They are, for the most part, the retreat of the casual, unpretentious drinker, and it is for this reason that they are my preferred spot for drinking in Brazil. Have you got any recommendations? Tell me about your favourite botecos / drinking spots in São Paulo and around Brazil. Yes, it was probably one of the most horrifying experiences of my time in Brazil! You should visit “Boteco do Zoio”, in Paulista ave., right next to the Brigadeiro Subway Station. There’s a boteco with no name close to the Brigadeiro underground station (green line). It is located on the corner of Alameda Santos and Rua Manoel da Nobrega. The boteco itself has a narrow entrance, but you can find tables all over the sidewalk. So don’t waste your time trying to find a table inside once is much better staying outside. However, there are no roofing or canopies, so avoid it in raining days. Beers (600ml bottles – Original, Skol e Brahma) have a fair price and you MUST try the COSTELA (rib cuts) and CUPIM (ox-hump). Definitely it worth a try! Thanks! Apart Charme and Augusta I always get stuck thinking about places to drink when I’m on Paulista. great essay about a “pé sujo”!! It’s very true and the same with pubs. 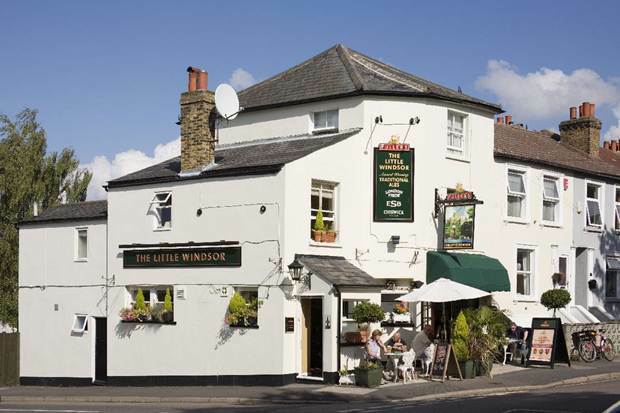 My Dad’s old local in London had a mix of people – builders, solicitors, consultants, shop workers, teachers, social workers, etc. As long as you got your round in you were fine! Try Puppy, Paulista Avenue, after 17h30. Thanks Regina, great tips as ever! I’ve only been to one boteco, Boteca 98 in Botofoga, Rio de Janerio. It was the first “bar” I went with my friends after arriving in Rio for Carnaval last year. Since it was almost right across the street from my friends apartment, we ate there quite a bit. One night I had ribs cooked with garlic and it still makes my mouth water thinking about them. One thing that was interesting to me, was when we ordered more bottles, we took the empties and placed them on the ground. At the end of the night, the waiter just counted the empties on the ground to calculate how many we had. The bottle counting is pretty standard and is actually quite preferable because I’ve lost count of the number of botecos I’ve been to where the waiter has brought back the bill wrong because – presumably – they just guessed how many we’d drunk! I have to say, I loved your article. It’s funny how most of the characteristics you mentioned could have been seen as bad ones, but they are the very reason we love those places. There’s a place almost at the bottom of Augusta (past the ‘puteiros’ xD) where I traditionally go with my friends and we used to call it “Podrão” (something like “rotten”… you can guess why), and our tradition was to open the night with a shot of Velho Barreiro cachaça… but the bastards never gave us a normal shot, it was almost like a regular glass of water, a full CUP of cachaça… and we would drink it all at once. Cachaça sends a shiver down my spine – but to be fair so do most spirits. I’ll have to check out the boteco though, although there’s probably a good chance I’ve been there already! About the names of ‘botecos’, engaging with my other comment, elsewhere on this blog, from my personal experience being a lover of botecos since before being legally allowed to drink, I believe most of them go by their nicknames rather than by their ‘official’ names. These nicknames are most commonly the owner’s own name or nickname. As for my personal boteco recommendation: my favourite drinking place in the entire world in Kintaro, this ridiculously tiny boteco at R. Tomáz Gonzaga 57 in Liberdade, a five-minute walk from the Metro station… it is run by a Japanese-Brazilian family: a mother who stays during the day and prepares all the delicious food they sell, and two sumo-wrestling brothers who run the place at night. One of them defines their food jokingly as ‘fusion cuisine’, as what they serve ranges from your regular ‘boteco’ food such as torresmo (pork scratchs), fried cassava and pastel, to Japanese-style aubergines fried with miso paste and ginger, delicious pork chops with miso and this tangy vegetable known as chingensai, among other delicacies. In winter they serve oden, a kind of stew containing raddish, algae, tofu, eggs and other stuff. Ambience-wise it is definitely a pé-sujo, albeit slightly more expensive. Food portions cost R$ 10 each (but some of the stuff they serve you can’t find anywhere else) and beer bottles are R$ 9 (Original and Serramalte only). Also they only take cash. If you’re interested, I’d be more than glad to share a couple beers with you around there, just let me know. I think I may have been to that boteco. I’ve definitely been to one or two on that street, as well as one of the restaurants. Liberdade is very cool! Not sure if you saw but I’m moving to Peru at the end of this month, but I’m back for the World Cup so maybe we’ll catch that beer then! Nope, I didn’t see it! Did you find a job in Peru? Seems like a nice country. I guess Brazilians have very little knowledge about what goes on in its Andean neighbours. Last May I spent a week in Quito and I was surprised both at how little I knew about Ecuador (and Colombia, since I met many Colombians there) and at how beautiful and amazing those countries really are. It’s a shame I only met your blog now. I hope you have a great life in Peru, and rest assured that São Paulo will always welcome you back with open arms. Well, whenever you catch yourself missing São Paulo, just think of the pavements and that longing will certainly fade away!